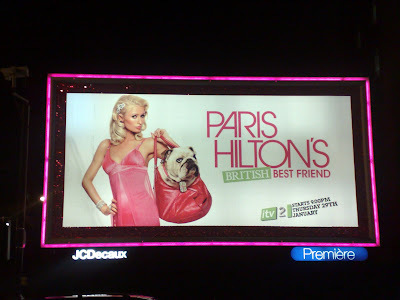 Paris Hilton's big pink London billboard! Paris Hilton has a new show on ITV2 called 'Paris Hilton's British Best Friend.' Starting on the 29th January, Paris Hilton's reality show quest for a new British best friend is being promoted by this huge, pink neon, billboard on London's Tottenham Court Road! If you want to see for yourself, I have created a Google Map showing where the Paris Hilton billboard is - click here. The Paris Hilton British Best Friend show also a range of online activity around it. There is a dedicated Paris section of itv.com that gives background to the show, video previews and details of contestants. However, whilst the online activity features various video content, there doesn't seem to be much opportunity for fans to discuss the show or interact with it in their own social spaces. If you compare the www.itv.com/paris microsite to the MTV microsite produced for the US version of the show this becomes even more obvious. Both microsites are nicely produced and well put together, but the MTV site allows fans to interact with the show via Facebook, MySpace etc and also discuss the show through a range of onsite message boards. Whilst the size of the billboard and the slick production of the ITV microsite shows that Paris Hilton's British Best Friend has had significant investment to attract viewers, adding social features could have made the content even more engaging for the target audience? Russell Brand and other UK celebrities rush to join Twitter! Perhaps ITV were worried that Paris Hilton might draw more negative comments than positive ones in the UK! Either way, I have to agree that it is a missed opportunity to get people talking more about the show (good or bad - publicity is publicity) and perhaps draw in more potential viewers that would perhaps be on the border to these types of shows otherwise.